Historically, Pontresina has never had a catastrophic avalanche (one that wiped out mulitple people or buildings). But nevertheless, it is in an area that is very prone to avalanches and there was the potential for an avalanche large enough to wipe out a large portion of the town. So in recent years a huge effort was undertaken to reduce the risk of a huge avalanche. On the mountains in the distance of this picture you can see a number of snow fences in among the rocks. They are designed to prevent avalanches from starting in the first place. But if the fences fail and an avalanche gets going, the dams in the foreground are meant to catch and hold a large portion of the snow, but more importantly to slow the snow down before it hits the town. My choice of perspective (wide-angle to show the fences and the dams) minimizes the size of the dams - they are actually quite huge. 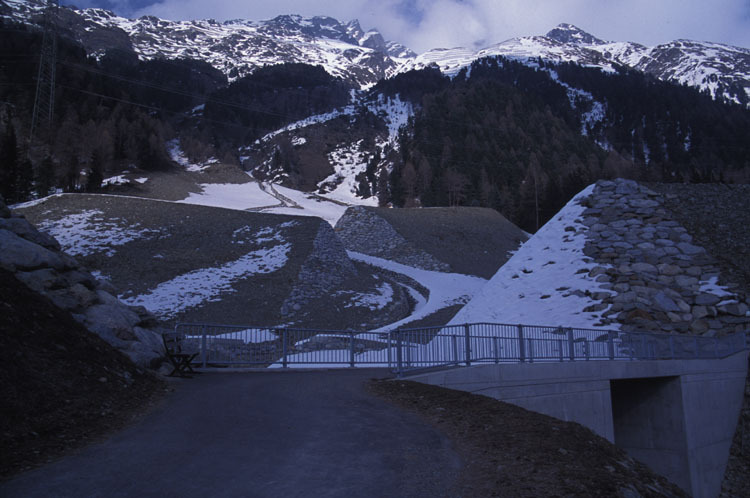 They are designed to hold 280,000 cubic meters of avalanche debris and 100,000 cubic meters of debris flow (rocks, soil, etc). There is a good article about Pontresina's avalanche defenses here. Felix Keller, who is quoted in the article, gave a presentation to us one evening of the conference. Another point that the article brings up which Felix also talked about in more detail is that the avalanche fences built high on the slopes above Pontresina are anchored in permafrost. As the local climate continues to warm, that permafrost will melt and then the fences will begin to fail. Already they are creeping down the hill at rates of 5-20 cm per year.